Slackhacker – Page 2 – Hackin' and slackin'! The venerable OS X file manager, the Finder, is not a perfect tool. Finder is probably one of the aspects of OS X I like the least. It’s good for cruising around file systems in “column mode” and for browsing media files with Coverflow but for serious file management work I tend to want to drop into the Terminal as soon as possible. Problem is that the new Terminal window will not be in the same folder as to where I’ve navigated in Finder, causing me to lose context – every time. 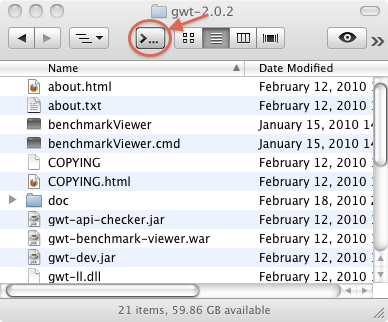 Recently I stumbled on cdto – a little app that adds an icon to Finder that open a Terminal window. With the current working directory set to the folder shown in Finder! No context lost! When applied together, these two small tips makes it possible to use Finder only for the tasks where it shines. Clojure – Functional Programming for the JVM by R. Mark Volkmann is both a great introductory article and a handy reference. Actually a cheap aspiring functional programmers alternative to Programming Clojure! MiGLayout: The one Java layout manager that does it all by Chris Hardin is another of the many excellent Java News Briefs by Object Computing, Inc. (OCI). MIGLayout is a Java Swing UI layout manager which is as powerful and expressive as the Clojure programming language. This makes MIGLayout an excellent choice for all your Clojure UI needs! Full Disclojure is a series of easily digested screen casts highlighting a particular feature of Clojure in each episode. The screen casts are accompanied by clear audio and the well-paced action takes place directly at the REPL (as it should!). Full Disclojure is on an accessible level for newbies and covers, among other topics, many of the cool features introduced in Clojure 1.1.0. Hot Code Swapping is not the exclusive domain of Erlang! 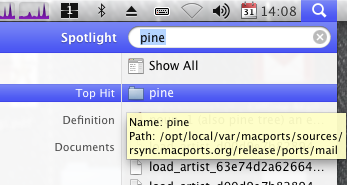 A more graphical option for the occasional port lookup is to use OS X built-in file indexing system Spotlight that happily provides as-you-type matching of available ports in the local ports tree. The corresponding port file directory will typically be the top match when searching for well-known unix software.